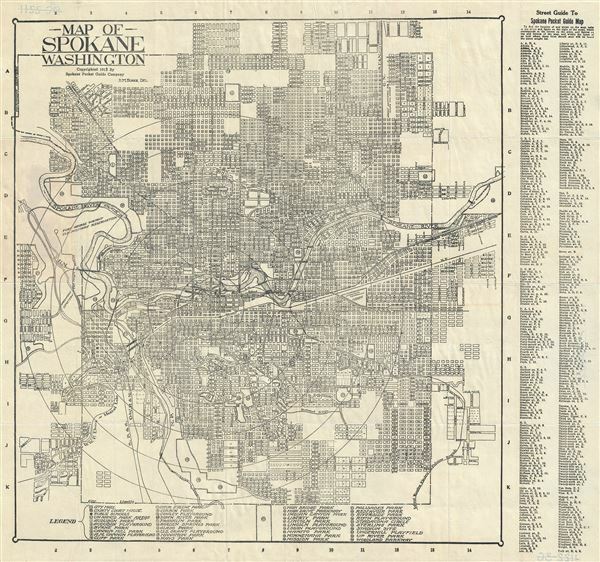 This is a 1915 map or city plan of Spokane, Washington by D. M. Faires. It covers the city of Spokane and vicinity. Shows the Spokane River passing through the city. The map is highly detailed, noting individual streets, bridges, cemeteries, etc. The Fort George Washington U.S. Military Reservation is noted. A street guide is included along the right margin. The bottom contains a legend noting the various parks, playgrounds and government offices located on the map. This map is copyrighted 1915 by the Spokane Pocket Guide Company. Very good. Minor wear along original fold lines. Minor print crease, lower left quadrant.